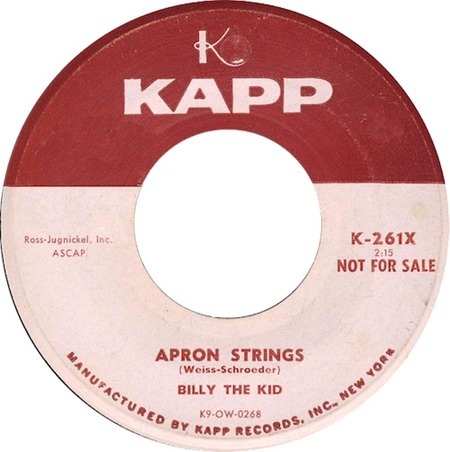 Billy The Kid recorded this song on 12 January 1959 (probably); it was released on 2 February 1959 on Kapp K-261X with the song "I Hardly Know Me" on the B-side. This seems to be the only record ever made by this mysterious individual—nobody seems to know anything about this particular Billy The Kid, though one report suggests that he was none other than David Hill, the person responsible for the original version of "All Shook Up." Little David (also a Schroeder, so perhaps he was writer Aaron Schroeder's son) also recorded the number in 1959 for US release, as did Jay B. Loyd (together with Bill Black's Combo, no less), and somehow or other, the relatively new British excuse for a rock'n'roller, Cliff Richard, also got hold of the number and recorded it a little later. On the set "Platinum: A Life In Music" the number is included as part of a track called "The Bad Nauheim Medley," (Elvis's house was in Bad Nauheim), which further includes "I'll Take You Home Again Kathleen," "I Will Be True," "It's Been So Long Darling" and "There's No Tomorrow."